Omega3 fish oil supplements are recommended for inflamed and non-inflamed acne. While recommended for all acne sufferers, they are particularly beneficial for women who suffer from pre-menstrual breakouts. Omega3 fish oils also positively alter sebum production in the skin, improving radiance and resilience. Vitamedica’s concentrated formula is one of the highest available. This means you take fewer capsules to obtain the widely-recognized anti-inflammatory and anti-acne benefits. 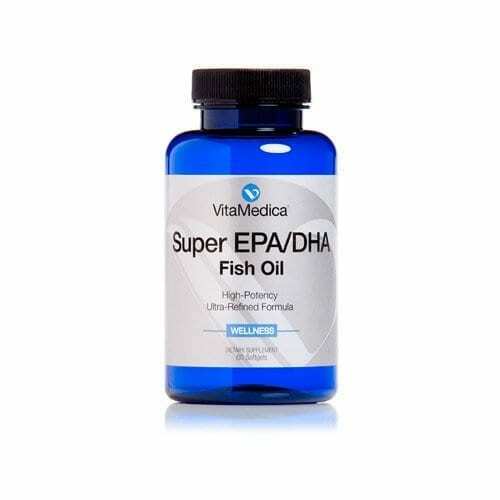 Whether you can’t fit salmon into your weekly meals or worry about the mercury content of ocean farmed fish, Super EPA/DHA Fish Oil ensures that you obtain these essential Omega-3 nutrients in your diet. For treatment of inflammatory acne, 2000 mg of Omega3 fish oils are prescribed per day.